Every year we hold this classic ride and with a bloody good reason: Its a classic. 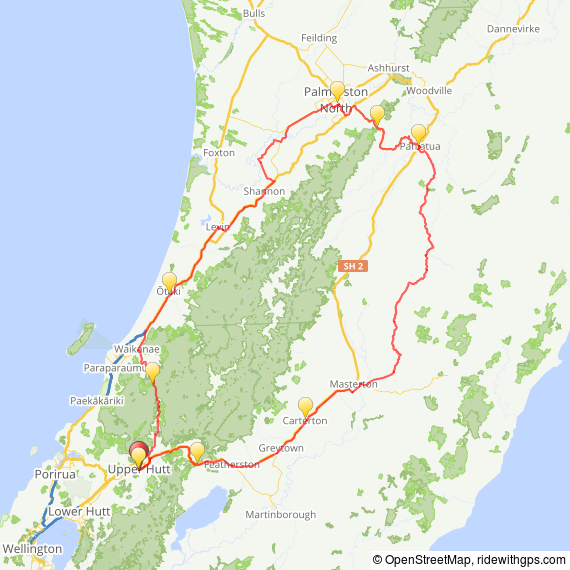 Its got everything a classic should have: long climbs - twisty technical descents, cafes, pies, quiet rural roads in blistering heat, followed by the sunset over Kapiti, and a little bump over a quiet mountain road to get back to Upper Hutt. GPS Route information is available on RideWithGPS. You can download to your GPS, or join the Kiwi Randonneurs Club on RideWithGPS to get access to offline route navigation using the RideWithGPS App on a smartphone.